There is direct surface evidence for two forms of mantle upwelling: flows associated with accretional plate margins, which we also refer to as spreading centers and mid-ocean ridges, and localized upwellings beneath volcanic hot spots, which we refer to as mantle plumes. In addition, seismic tomography provides some evidence for larger-scale upwellings at depth. First we discuss the character of upwellings beneath spreading centers, the mid-ocean ridges. The central question on their role in mantle convection is whether the upwellings at spreading centers are active or passive [Question 3.10]. Here the term "active" refers to upwellings driven primarily by their own buoyancy, whereas the term "passive" refers to upwellings driven primarily by stresses derived from plate divergence. This is an important distinction in the theory of mantle convection. Since active upwellings represent dynamically complementary structures to the negatively buoyant downwellings in a convecting fluid, we should expect the upwellings beneath spreading centers to extend to the base of the convecting region, if they are active. In contrast, there is no such restriction on the depth extent of passive upwellings beneath spreading centers. The observable characteristics of spreading centers favor the passive upwelling hypothesis. As shown in Figures 15.1 and 15.2, seismic tomographic images of the mantle clearly indicate the presence of seismically slow and presumably hot regions beneath mid-ocean ridges. However, with the exception of the East Pacific Rise, these anomalies do not extend deeper than about 350 km into the mantle. This observation suggests that, in most places, upwelling beneath mid-ocean ridges has a shallow origin. Even in the case of the East Pacific Rise, the anomaly is confined to the upper mantle. In addition, the mid-ocean ridges have a negligible geoid signature, implying that they are compensated isostatically at shallow depths. If the upwellings beneath spreading centers were active, then at least some part of their topography would be dynamically supported at depth. This would result in a measurable geoid anomaly, which is not observed. It is important to note in this context that the role of the mid-ocean ridges as the major source of magmatic and volcanic activity on the Earth does not require active upwelling. Mid-ocean ridge magmatism can be explained by pressure-release melting in a passive upwelling beneath spreading centers. Upper mantle material contains a low melting temperature component. This component is about 20% of the total and melting of this component forms the 6 km thick basaltic oceanic crust. The melt is produced at depths of less than 50 km and rises to the surface due to its positive buoyancy, by some combination of porous flow and magma fracture. Although magma is generated over a relatively wide zone in a passive upwelling, the ocean crust is actually formed in a narrow region in the vicinity of a ridge crest; the mechanism or mechanisms responsible for this focusing have not been established [Question 4.7]. Although geophysical evidence favors the interpretation of shallow and rather passive upwellings beneath the global system of spreading centers, it is not obvious from the theory of convection why this should be the case. For example, in a homogeneous fluid, upwellings beneath regions of large-scale surface divergence typically extend to all depths, even if they are passive. What causes the upwellings beneath mantle spreading centers to be shallow? The likely explanation can be found in the accretional process at the ridges and the effects of the transition zone on passive upwellings. The mechanism of accretion at spreading centers imposes kinematic constraints on mantle flow that are fundamentally incompatible with convective upwellings in a viscous fluid. First, the geometry of spreading centers consists of diverging ridge segments alternating with transform faults, across which the motion is transverse [Question 2.1]. In a viscous fluid, the divergent motion of the boundary induces a poloidal flow, whereas transverse boundary motion induces a toroidal flow. Only the poloidal part of the motion is compatible with convection. 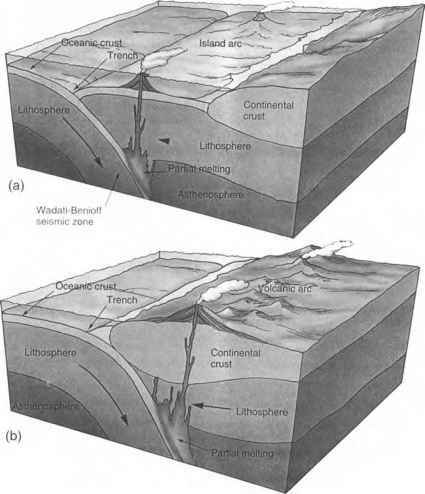 Second, spreading centers migrate over the Earth's surface in response to the stress distribution in the plates, rather than in response to buoyancy forces deeper in the mantle. Ridges evolve by rift propagation along strike, and by rapidly migrating in the spreading direction, sometimes jumping to new locations almost discontinuously. These observations indicate that brittle failure, rather than distributed viscous flow, governs the deformation in the oceanic lithosphere. Spreading centers can migrate away from mantle upwellings in response to the forces in the plates. We therefore conclude that mid-ocean ridges represent a shallow, passive upwelling of the mantle in response to the tearing of tectonic plates under the pull of sinking slabs. Mid-ocean ridges do not represent deep active upwelling sheets of hot mantle material. Unlike the surface pattern of subduction zones which reveal the sites of deep mantle downwelling, the surface pattern of mid-ocean ridges says little about active deep mantle upwelling. Mid-ocean ridges reflect a pattern of shallow passive mantle circulation forced upon the deep mantle convection system by the brittle rheology of the plates. In order to produce concentrated linear regions of shallow upwelling and divergence, models of mantle convection would have to incorporate a mechanically strong layer at the surface to act as a stress guide for the tension supplied by the slabs, and a brittle-fracture or plastic rheology of the layer to give sharp or discontinuous features of extensional strain. In concluding that spreading centers generally represent shallow mantle upwellings, we beg the question: Where do deep mantle upwellings occur? Clearly they must exist, in order to balance the mass flux into the lower mantle from slabs. There is in fact evidence for two types of deep mantle upwelling structures. One type is the broad-scale lower mantle upwellings inferred from the pattern of seismic heterogeneity. As shown in Figures 15.1 and 15.2, there are two mushroom-shaped low-velocity anomalies in the lower mantle, one beneath Africa, the other beneath the Southwest Pacific, that extend from the core-mantle boundary to the transition zone. These structures are more or less surrounded by a sheet of high-velocity (cold) material that we identify as (at least in part) former lithospheric material. Assuming that seismic velocity heterogeneities correlate with density heterogeneities, these low-velocity structures represent positively buoyant material and large-scale upwellings in the lower mantle. They appear to deflect near the base of the transition zone (especially the structure beneath Africa), suggesting thatmantle upwellings are impeded by phase transitions or perhaps a subtle compositional stratification between the upper and lower mantle. We now turn to the second generally accepted form of mantle upwelling, mantle plumes beneath volcanic hot spots. Seismic evidence for the existence of mantle plumes is beginning to emerge, but remains fragmentary. Most of the ideas about mantle plumes derive from the widespread and long-held interpretation that many hot spots are the surface expressions of mantle plumes [Question 11.1]. Theory and numerical models of convection indicate that mantle plumes originate from instabilities of a thermal boundary layer at the base of the lower mantle, the base of the upper mantle, or both [Questions 2.9, 11.4]. Another question is whether all plumes produce volcanic hot spots [Question 11.2]. The surface volcanism of hot spots associated with mantle plumes requires the penetration of magma through thick oceanic and continental lithospheres. It is entirely possible that some mantle plumes rise to the base of the lithosphere but fail to produce a hot spot, either because they do not produce sufficient magma, or because the magma, which must fracture its way through the lithosphere, does not reach the surface [Question 4.8]. Temperature-dependent mantle viscosity focuses the thermal and velocity anomalies of plumes into small diameter cylindrical structures and helps to maintain their narrowness. In a fluid with a thermally activated viscosity of the Arrhenius type, steady plumes consist of a narrow cylindrical high-velocity conduit imbedded within a broader cylindrical thermal halo [Question 11.8]. The high-velocity cylindrical core is typically several tens of kilometers in diameter with upward motions at speeds of nearly a meter per year. The cylindrical thermal anomaly is about twice as broad with excess temperatures of perhaps several hundred Kelvin. Because of the strong temperature dependence of mantle viscosity, plumes in the mantle could have dimensions as small as 10 km. The narrowness of ascending plumes is destroyed by the interaction of plumes with the lithosphere. The lithosphere deflects the upward plume flow horizontally along its base, resulting in a broad flattened flow region. Major hot spots are usually associated with litho-spheric swells. These are broad elliptical zones of elevated topography with diameters of about 1,000 km. The widely accepted hypothesis is that this elevated topography is the compensation of the excess buoyancy of the deflected plume [Question 11.3]. This association has allowed a quantitative determination of the heat transported in the mantle by plumes [Question 11.5]. It is estimated that mantle plumes beneath recognized hot spots carry about 10% of the Earth's surface heat flux. The heat flux from the core to the mantle is estimated to be about this amount, so the energetics of hot spots are consistent with plumes originating at the core-mantle boundary [Question 4.14]. Support for a core-mantle boundary origin of at least some mantle plumes comes from the correlation between the locations of some of the most energetic hot spots at the surface and seismic ultra-low velocity zones at the base of the mantle. However, some surface hot spots are so small, in terms of their heat transport, that it is difficult to envision them originating at such great depth. The precise relationship between mantle plumes and the general mantle circulation remains an open question. The large-scale images of mantle structure obtained from global seismic tomography such as Figures 15.1 and 15.2 do not show evidence of mantle plume structures that would produce localized hot spots. For the most part, mantle plumes are envisioned as secondary scale flows arising from an instability in a hot, low-viscosity, basal thermal boundary layer, perhaps located at the core-mantle interface [Question 11.6]. The observation of near-stationary hot spots - that the motion of hot spots relative to one another is generally small compared to the velocities of the overlying plates and the plate boundaries - has been interpreted to mean that plumes are decoupled from the large-scale flows that drive the plates. According to this view, plumes drift in response to the "mantle wind" beneath the plates, and the relative motion of hot spots reflects the time variations in total mass flux beneath the plates. This is likely an oversimplified picture of the real situation, however. Models of convection with boundary layer instabilities and plumes indicate that mantle plumes interact more strongly with larger-scale components of mantle motion. In particular, convection models indicate that plumes modify their local environment in a large-scale convective flow, in effect creating conditions more conducive for stationary hot spots. They cast doubt on the concept of hot spots originating from unconnected plumes that rise at random locations in the mantle irrespective of the general circulation pattern. Instead, convection models suggest that mantle plumes may be connected by a network of thermal ridges in the basal thermal boundary layer and that the plumes form at the intersection points of the thermal ridges. According to this interpretation, it is these ridge intersections, from which the plumes originate, that map into hot spot locations at the surface. Mantle plumes do not simply arise from the instability of an otherwise undisturbed lower thermal boundary layer. Their locations are influenced by the large-scale flow, in particular the sinking and spreading out of the relatively cold downflows which modulate the lower thermal boundary layer and determine where the thermal ridges form. These downflows thin and even remove the hot lower boundary layer where they descend, suppressing plume formation there. The hot material is driven laterally in the boundary layer, where it converges into thermal ridges. Where the ridges intersect, upwelling plumes form. Mantle isotope ratios indicate that the source region for ocean island basalts (OIB) is more enriched and much more heterogeneous than the source region for mid-ocean ridge basalts (MORB). The OIB cannot be obtained from the same source region as MORB. In addition, some OIB have isotope signatures indicating a primordial component. For example, high concentrations of 3He found in Hawaii and elsewhere appear to require a source region that has not been previously differentiated. This is a strong argument for an isolated lower mantle reservoir [Questions 12.1, 12.2]. The variety of isotope signatures found in OIB requires about 2 Gyr to develop. Thus, the source regions must have been isolated for this length of time. Two explanations have been given for this isolation: (1) significant volumes of the mantle have remained isolated on this time scale, and (2) isolation has occurred in the continental crust and underlying lithosphere [Question 12.4]. Studies of mantle mixing appear to preclude the isolation of sufficient volumes of the mantle on the required time scale. The preferred explanation is the relatively recent delamination of continental crust and lithosphere which can produce the required isotope signatures. The delaminated material becomes part of an ascending plume from the basal boundary layer [Question 12.3]. The mantle plume hypothesis offers compelling explanations for several long-standing problems in lithosphere dynamics. One of these is the elevated heat flow in old lithosphere. Heat transfer from plumes to the base of the lithosphere significantly contributes to the surface heat flow in old oceanic lithosphere and in continental lithosphere. However, even the plume contribution is not enough to explain why the old lithosphere reaches thermal equilibrium. This indicates one of two possibilities: (1) there are more mantle plumes than surface hot spots, or (2) there are secondary convection cells beneath the plates. Mantle plumes have been assigned an important role in the initiation of an accretional plate boundary [Question 2.15]. The lithospheric swells associated with plume-initiated hot spots in the continents result in three-armed rift systems. Where these systems interact, they rupture the continental lithosphere resulting in the formation of a new ocean. Another important aspect of the ascending flows associated with plumes is the concept of plume heads, a concept primarily drawn from laboratory experiments. Several hot spot tracks appear to have been initiated with a massive flood basalt eruption. According to the plume head model, flood basalts form by the partial melting in a large-volume plume head as it impinges on the base of the continental lithosphere [Questions 11.7, 11.10].